The Kaypro II, a whopping 64K of memory, two Tandon SS/DD 5 1/4 Drives, and a 9" green screen that would make any Osborne user think he or she had just arrived at a drive-in sized screen (remember drive-ins, they were just going out of style when the Kaypro was going in). 2010 A Space Odyssey was reported to have been written on a Kaypro! CP/M operating system, had it evolved, would have rivaled Mac OS or even Windows95 -- or at least that's my opinion. This powerhouse came with Perfect Writer and Wordstar and a host of other software. And it was PORTABLE! Yes! A Portable computer which was just slightly smaller and lighter than a bank safe. How do I know it was portable? Well, it had a handle on the back side, right under the serial port. My invstment in Kaypro didn't stop there. I bought the Kaypro 2X, an advanced system with 64K of memory, DS/DD 5 1/4 drives and a 300 baud modem (fasten your seat belts on that one). This powerhouse had INVERSE VIDEO. Other quasi-portable computers include the Osborne 1, the IBM 5155 Personal Portable Computer, and the Commodore Executive 64 (SX-64). 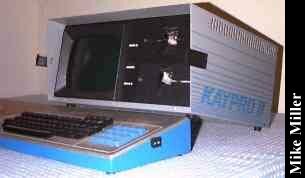 Click here to view all comments for the Non-Linear Systems Kaypro II and to leave your own.